Oh snap, Perez Hilton is being sued by many many photo agencies who have united together to sue for $7.5 million. Uh, sure. Sounds like a good number to me. The agency is claiming that they have lost out on a ton of profit since Perez posts photo’s from their sites, etc. 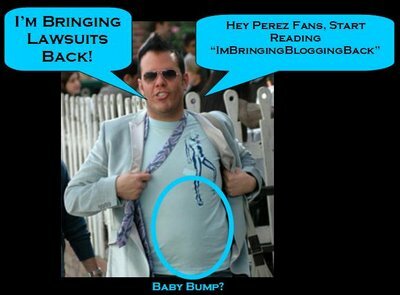 Poor Perez typically doesn’t even give these sites credit for these photo’s either. At his site, he charges between $9,000-$16,000 PER WEEK for advertisements. Yeah, I’m pretty jealous of that. I charge $100/month. Is that too low? I think the only business who would pay for ads on my site would be the dry-cleaner up the street from me and they would probably only commit to like 2-weeks of ads. According to TMZ.com Perez has stated that he has yet to be served with a lawsuit, but will address the situation when he and his lawyers receive the lawsuit and have the opportunity to do so. Maybe some of Perez’s readers should stop by IBBB for day old news? But, hey, my news may not be “breaking” but it is funny. Oh, and you would NEVER find the brilliance of “Harriet Carter Wednesday” on PerezHitlon. Spread the word.